Eastern Equine Encephalitis (EEE) and West Nile Virus (WNV) have been found in mosquitoes trapped in Sandown. 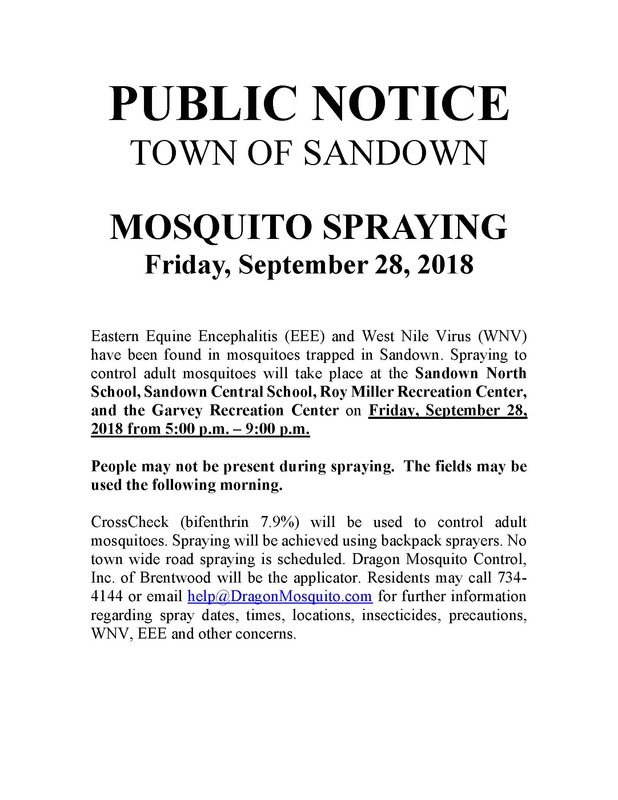 Spraying to control adult mosquitoes will take place at the Sandown North School, Sandown Central School, Roy Miller Recreation Center, and the Garvey Recreation Center on Friday, September 28, 2018 from 5:00 p.m. – 9:00 p.m.
People may not be present during spraying. The fields may be used the following morning. CrossCheck (bifenthrin 7.9%) will be used to control adult mosquitoes. Spraying will be achieved using backpack sprayers. No town wide road spraying is scheduled. Dragon Mosquito Control, Inc. of Brentwood will be the applicator. Residents may call 734-4144 or email Email for further information regarding spray dates, times, locations, insecticides, precautions, WNV, EEE and other concerns.